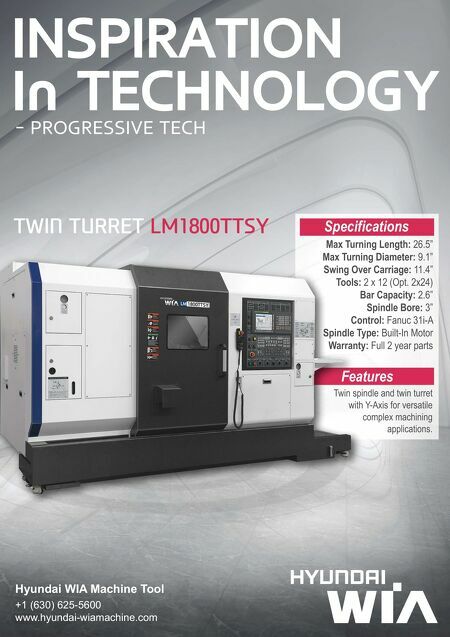 24 MMS November 2017 mmsonline.com RAPID TRAVERSE Machining Technology in Brief Nozzle Technologies Speed Fusion Laser Cutting, Reduce Gas Consumption BY D E R E K KO R N F usion laser cutting uses an inert gas, such as nitrogen, at high pressure to blow molten material out of the kerf. For mild steel, it offers an alternative to flame cutting using oxygen, espe- cially for relatively thick sheets, in that it doesn't leave behind oxidized cut edges that commonly require reworking. 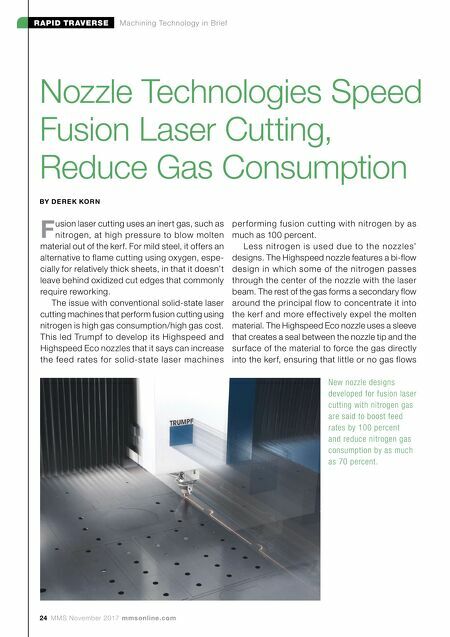 The issue with conventional solid-state laser cutting machines that perform fusion cutting using nitrogen is high gas consumption/high gas cost. This led Trumpf to develop its Highspeed and Highspeed Eco nozzles that it says can increase the feed rates for solid-state laser machines per forming fusion cutting with nitrogen by as much as 100 percent. Less nitrogen is used due to the noz zles' designs. The Highspeed nozzle features a bi-flow design in which some of the nitrogen passes through the center of the nozzle with the laser beam. The rest of the gas forms a secondary flow around the principal flow to concentrate it into the kerf and more effectively expel the molten material. The Highspeed Eco nozzle uses a sleeve that creates a seal between the nozzle tip and the surface of the material to force the gas directly into the kerf, ensuring that little or no gas flows New nozzle designs developed for fusion laser cutting with nitrogen gas are said to boost feed rates by 100 percent and reduce nitrogen gas consumption by as much as 70 percent.